Bref, ce projet de nouvelle franchise pour le public adolescent a déjà du plomb dans l'aile. What I can speak to is the movie, which is neither good nor so-bad-its-good; it languishes in a state of banal mediocrity for 106 very long minutes. Le manque de cohérence entre les scènes fait rapidement rire, les effets spéciaux à petits budgets (et pour un tsunami) aussi. La cinquième vague dépare ! This adaptation of the Rick Yancey novel is pulpy in the worst way. 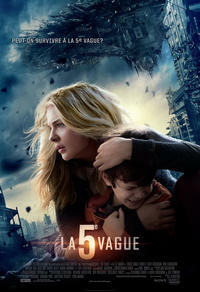 The 5th Wave, from the get-go, has difficulty establishing tone and mood. The frankly preposterous nature of the film's setup is rendered slightly less so by a couple of second act reveals. A smart, plucky teenager on the cusp of adulthood is thrust into action in this decent but not fully realized adaptation of Rick Yancey's novel. There are plenty of shoot-outs in The 5th Wave, but no interminable aerial combat. If there's anything new under the sun in the YA world, unfortunately, it doesn't appear to exist in The 5th Wave. That ''pumpkin'' makes the line ridiculous, but it's also the word that sells the overall conceit of a seeming lyordinary girl's life being transformed forever.